Quick! Tell me what these things have in common: an egocentric cat, a room full of panicked sheep, a frog prince, giant red mushrooms, a steadfastly fishing gnome and several three-eyed, two-fingered aliens. “Nothing,” you say. Not so, at least not now. All are components of Mr. Smoozles Goes Nutso, the first independently produced game from Steve Ince’s Juniper Games. Since 2004, Steve has been publishing an online comic strip called “Mr. Smoozles.” It stars a free-thinking, outspoken, alien-phobic orange cat whose world is “peopled” with quirky cartoon animals. Mr. Smoozles Goes Nutso is the offshoot and culmination of the comic strip. 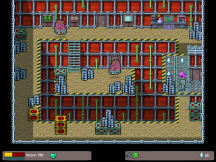 It is a third person, keyboard controlled, part arcade game, part adventure game. It’s available as a 15.2 MB download from http://www.juniper-games.com. “As a scientist, it strikes me that all realities are equally valid.” Gladys, the Smoo formerly known as Glu. Nutso introduces (and ends) its story with colorful cartoon graphics. The gang from the “Smoozles” comic strip watches the arrival of the evil Goragons. These triple-snouted purple aliens are on a mission to alter the “fabric of reality.” Everyone but Ed and Smoozles are captured. Hit by a mind-altering ray, Smoozles begins hunting Ed. Thus starts Ed’s quest (and yours) to find and free the others. You also must return Smoozles’ mind to normal (at least, normal for him) and restore reality. It isn’t easy to accomplish these goals. Ed has to evade Smoozles and his big gun, stay away from the Goragon’s robots, and dodge various mines. Ed interacts with sundry whimsical characters and explores multifarious environments. These include my favorite -- the giant mushroom land, and my second favorite -- the Men’s Corset Making Club. Happily, evading Smoozles is a small part of the game. In several areas Smoozles chases Ed and fires freely whenever he catches sight of his victim. However, you soon discover areas which are Smoozles-free. There you can slow down, take a breath and explore. Nonetheless, you won’t find lots of intriguing but irrelevant hot spots. The hotspots in Nutso, with one significant exception, are important to the game. That exception is the scattered cartoon strips that decorate the walls. Viewing them (use the Ctrl key) does not advance the game’s plot. However, the cartoon strips do give you some of the characters’ backstories. Hotspots sparkle as you near them. They continue to sparkle after they are no longer useful. This resulted in many unfruitful clicks. You can die anytime. Contradictorily, sometimes dying is a great help. 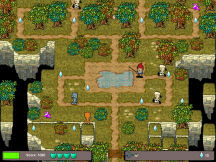 Initially, players have three lives, with bonus lives available. As Ed is shot, he looses lives. When all his lives are gone, he spirals away. The “Continue” button allows Ed to try again from the spot where his “reality failed,” but with the addition of three extra lives. While I prefer never to die in games, this system worked very well. Nutso provides three levels of difficulty: easy, normal, and hard. You can play with hints on or off. For this review I played on the easy level with hints off. For evaluation purposes I played part of a game using the in-game hints and discovered that they were extremely helpful. There is no in-game map provided. It was helpful to draw a simple one as I played. There is one area in Nutso which dictates that you travel between two points repeatedly. I did not mind the back and forth, but having to repeatedly push one out-of-the-way button was tedious. Nutso is an inventory driven game. Most of Ed’s missions require him to find an item and use it in some way. In addition, there are a few logic-type puzzles. My favorite puzzle involved helping Ed revert to his normal self from a metamorphic state. There are three puzzles with specific time limits, but the limits are generous. Color-coded doors require a matching key. Since Ed announces the color needed, this makes these puzzles solvable for those with color discrimination difficulties. 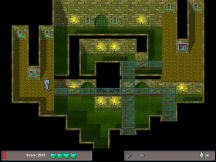 Nutso has no sound puzzles, sliders, or mazes, unless you consider the various rooms and levels of the game to be one colossal maze. Nutso utilizes easy-to-use keyboard controls. The arrow keys control Ed’s movements, the Enter key performs most functions, and the Ctrl key reads signs, etc. In-game instructions inform the gamer of other keys as they are needed. In light of the “Continue” button, the eight save slots are adequate -- though my preference is always for unlimited saves. You can save any time. Saves are automatically named with the location and the time. Inventory is picked up via the Enter button and is used the same way. If you have the correct item in inventory, move Ed to the hotspot and push Enter. The correct item will be used. No dragging inventory items around trying them on every spot. My favorite feature is the information screen accessible from many of the “rooms.” You can refresh your memory by viewing game objectives. These are automatically updated as they are acquired. No note taking is necessary. Our hero, Ed, is a blue, slightly popeyed cat who serves as a balance for Smoozles’ over-the-top, curmudgeonly personality. Ed’s flatfooted, all-out run and his cute little wiggle won my heart right off the bat. Even those few times I was clueless about what to do next, Ed’s movements brought a smile to my face. Familiarity with the “Mr. Smoozles” comic strip is not needed to enjoy the game, but will provide a better understanding of the relationships between the characters. For example, Ed’s mission in the game is to rescue Watford, the monkey; Pepper, the cat; Finny, the flop-eared dog; and Grik and Zoran, aliens. Some information about these characters is revealed during game play. But by reading the online comic strip, I learned that Watford is a computer geek partnered with Ed making a computer game. Smoozles is enamored of Pepper, who is not infatuated with him. Finny is smitten by Smoozles (who detests her), and Grik and Zoran are representatives of the Galactic Council. Nutso is littered with Smoos, small orange creatures from a different reality who all have rhyming names. You’ll meet Yew, Troo and Roo to name a few. My favorite non-player characters are Cecil and Cyril, a couple of odd ducks -- actually a dog and a squirrel – whose longstanding friendship is hidden behind peevish gibes. There is no spoken dialogue in Nutso. Text boxes display conversation and there are no dialogue trees. The player simply hits “Enter” to talk. Occasionally, I thought the conversation was over because the text box disappeared, but I soon discovered there may be more to be learned. Keep hitting “Enter” until you no longer get a response. The dialogue is not extensive. It generally sends Ed on a mission or provides needed information. There are humorous moments sprinkled throughout. The story is not deep or dark. Instead, it gently amuses the gamer with teasing revelations and ironical plot twists. Befitting the cartoon genre, the 2D graphics are bright and vivid. Each of the 60 plus locations has a unique look. There are no shadows and the background is, with a few exceptions, static. I noticed a few flickering flames and some rippling water, but this was the exception rather than the rule. 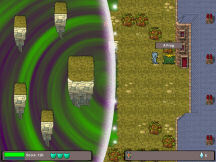 Both the dialogue and the settings pay homage to some well-known adventure standards such as the Box Room’s nod towards Broken Sword 3 and the “Don’t push this button” room. The angled overhead perspective caused a problem for me a time or two. For example, I had difficulty discerning which walkway Ed was on when paths crossed over or under each other. Background music (rather than ambient sounds) creates the mood in this game. Even so, you’ll notice some environmental sounds -- such as the transporter ray zapping, Smoozles’ gunfire, water dripping and elevators rumbling. However, Ed’s feet make no sound as he runs, doors don’t creak or slam, and most areas are quiet except for the enjoyable background music. Josh Winiberg’s original score provides tension and atmosphere. Ranging from lively to lyrical, it sets the emotional tone for the game. Game support can be crucial. Juniper Games’ support is excellent. I e-mailed Steve a few times seeking help. Each time he answered within twelve hours, frequently much sooner. That is first-rate, considering we live on different continents. I notice he regularly supplies hints in the GameBoomer forum. Also, he hosts a hints page at http://www.juniper-games.com/smoozles/Hints.htm. There are no patches for this game as of this writing. Nutso installed and ran with very few problems. The first and biggest problem was the opening screen. For some reason, the instructions: “Press Enter” are too far down to be seen on my monitor. When I first ran this game I thought I had a glitch. Finally, in a flurry of random button mashing, I hit the magic one. From there the game played flawlessly. Nutso is not a large game or a graphics intensive one, but for some reason it takes a long time to launch. Other than these two small aggravations, Mr. Smoozles Goes Nutso was stable. I wasn’t sure about playing Mr. Smoozles Goes Nutso, but I’m glad that I did. I loved the humorous nods to gaming classics and standards. The keyboard controls are easy to learn and soon take a back seat to the game play. I think this game would be a great starter game to introduce new gamers to keyboard controls and small bits of action. On the easy level, the action is fun and very doable with only a few places calling for quick movement. Even those have a generous time limit. And who doesn’t love to save the world?